Even though the global land surface temperatures have appeared to plateau since 1998 - a global hiatus - other measurements show global warming has continued with continued warming of the oceans, sea level rise, melting of Arctic sea ice, continued retreat of mountain glaciers. 2000 to 2010 was also the hottest decade on record. Significantly, Australia has broken many temperature records this year with the extreme January heatwave and Angry Summer, sizzling warming into late Autumn, a relatively warm Winter, and now the hottest September on record averaged across Australia, and the hottest 12 months on record. Australia is also on track for the hottest calendar year this year. The Bureau of Meteorology issued a Special Climate Statement updated on 13 October: Exceptionally warm late winter/early spring with unusually persistent warm conditions over the last 12 months (PDF). You can read the Climate Council analysis on this statement: ’OFF THE CHARTS – Record breaking September Heat and Climate Change’. Averaged over Australia, monthly maximum temperatures were 3.41 °C above average for September and monthly minimum temperatures 2.09 °C above average, combining to a monthly mean temperature 2.75 °C above average. All of these have set new September records for Australia, with the monthly mean temperature more than a degree above the previous record. 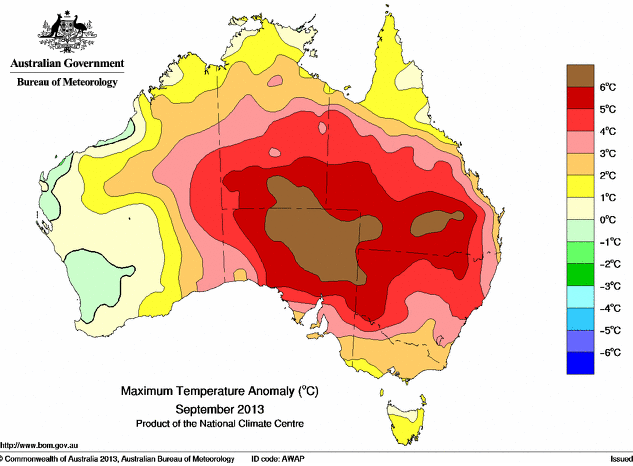 The monthly maximum and mean temperatures have also set Australian records for the largest positive temperature anomaly observed in any month. (The previous records are respectively, 3.16 °C above average in August 2009, and 2.66 °C above average in April 2005). Rob Gell read from the BOM statement at the AMOS meeting discussing the latest IPCC report and asked the science panel about the significance of these new records.